Township stays are becoming an increasingly popular highlight on many Cape Town visitors' travel itineraries. Experience the sincere hospitality and down-to-earth vibes of Cape Town's townships at Malebo's Bed and Breakfast in Khayelitsha, after a good township tour. Khayelitsha (from the Xhosa word for 'our new home') is the biggest and youngest township on the Cape Flats. It is also one of the poorest townships in Cape Town. Upon entering the township, children rush up to your car with bottles of water and squeegees, pushing against each other for a chance to wash your window for a Rand or two. Drive past the hustle and bustle of the shops, the billboards, the pimped out taxis (emitting passing bursts of the best Kwaito music), and the permeating red dust - and head towards the quaint face-brick house in Mississippi lane, Graceland, where Lydia Masoleng and her family lives, and where she runs her Township Bed & Breakfast. Lydia Masoleng has been running Malebo's B&B in Khayelitsha Township for 11 years. The name "Malebo" means "Mother of Lebo" (Lebo is her eldest son). Her Township B&B has been featured in iconic travel bibles like Lonely Planet and Rough Guides and she has won prizes in guesthouse competitions. Malebo can accommodate up to 6 guests in her comfortable B&B home (She can also accommodate bigger groups by organizing joint stays at Vicky's Bed and Breakfast down the road). For around R60 extra, Malebo will cook you a great traditional Xhosa dinner. Expect generous portions of chicken; red meat; Dombelo (African dumplings to dish up onto your meat) or 'pap' (maize mash); chakalaka (a spicy vegetable relish); and a selection of vegetables cooked in a traditional Xhosa way. Malebo's home-brewed Ungomboti (a traditional African beer) is one of her specialties. Guests can go on a walking township tour during the day and spend their evenings chatting with the family over the dinner table; visiting a shebeen with Malebo's husband - Alfred - or relaxing on a comfy couch, watching a local soapie with the family. Lydia also arranges entertainment on request: Drink a toast to the setting sun - sitting on a bench on the 'stoep' (porch) - while enjoying the soulful sounds of a Marimba band or a local guitarist. Lollie's Shebeen in Khayelitsha is just around the corner from Malebo's B&B. This funky little social hot spot exudes character. The walls of the township shebeen are painted bright red; shiny red table cloths are draped over the tables; and the curved bar counter's gleaming silver surface (framed by brightly coloured bottles of alcohol) is an aesthetic treat to the eyes. Bright plastic flowers in wire Coca Cola bottles decorate the tables. Beers are cheap and sold in quart sizes only; and the lively township jazz & kwaito blasting from the speakers will make even the weariest traveller's feet itch. Leaving Ma Lebo's B&B in Khayelitsha's Graceland after a hearty breakfast; a big hug from Lydia and a last peek at her picturesque fynbos garden (characteristic of the Cape Flats) you might look up at the sky and give a fleeting thought to 'The King' himself, contemplating that even he would have felt at home here - at Malabo's B&B. Price pp for 1 night (dinner, bed and breakfast): R350. Price pp for > 2 nights (dinner, bed and breakfast): R300. Transport available: R200 Price for a walking tour of Khayelitsha with the family: Free (A tour with a local guide can also be arranged). The sunsets and lazy conversations on the stoep are priceless. Experience the real Cape Town: Spend a night at a Township B&B after a township tour in Khayelitsha. 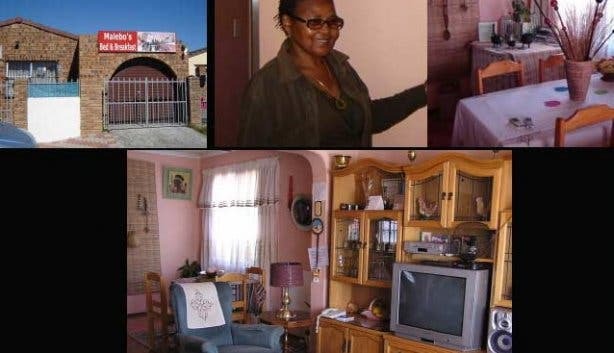 Enjoy the unique African hospitality of Malebo's B&B, Vicky's Township B&B and Kopanong B&B in Khayelitsha or head over to Langa and stay at MaNeo's B&B for a night or two. CapeTownMagazine.com knows the warm, hospitable South African women running these township establishments and features the cream of the 'Township stay' crop. Subscribe to our newsletter for excellent information.